Many of us know campfires as the warm glow around which we share memorable stories with our friends, and s’mores as the ideal way to cap the night from a dining point of view. 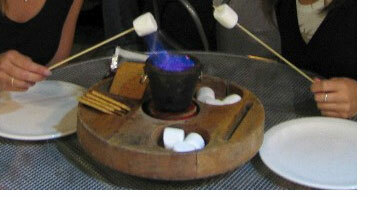 Fortunately for urban dwellers, there are some coffee shops that provide some of that charm with an indoor ‘campfire’ complete with all the fixin’s you need for s’mores. I joined a couple of friends for such an experience tonight, and I must say, through no coincidence, the conversation was quite memorable. If it weren’t for the excess decadence involved, it’d be a must at least once a week.